ICEBUG is a small independent footwear brand founded in Sweden in 2001. Their mission has been to create a range of sports shoes with superb traction on snow and ice, mud and wet rock. ICEBUG shoes are aimed at athletes involved in crosscountry, trail & fell running, orienteering, obstacle racing, coasteering and now, SwimRun. SwimRun demands a pair of shoes suitable for both off road running in mixed terrain and swimming. They need to be comfortable, have exceptionally good grip to handle the mud and slippery rocks you pass while entering and exiting the water, and must protect the foot and have a good fit to keep the foot stable whilst running on rough, uneven ground. They need to be close fitting to make sure they stay securely on your feet whilst swimming. They should absorb as little water as possible and then drain well to help keep your feet as dry as possible and to minimise extra weight. It’s a lot to ask from a shoe! Icebug UK sent me a pair of Acceleritas4 to try out whilst SwimRunning. Can they step up to the challenge? The Acceleritas4 are an eye-catching shoe, beautifully designed in bright and motivational contrasting colour ways with the distinctive ICEBUG branding on the side. Picking them up they feel sturdy despite their light weight. The UK size 7 I have on test weighs 197g (one shoe) and this is the lightest running shoe I have tried to date. The uppers are made in a tough nylon fabric that repels water and mud well and ICEBUG claim that they absorb very little water at that ‘The wet weight of the shoe is almost identical to the dry weight’. Before wearing mine I actually soaked then in water and then held them upside down until they stopped dripping and then weighed them again. They drained quickly and came out at 241g, so were each holding 44ml of water, which to be fair is not a lot at all, especially compared to some other shoes I’ve worn to swim in! the lacing system extends further down the foot than most other shoes, giving it a look and feel akin to a shoe designed for climbing or scrambling. This results in a tighter fit and the security of not losing your shoe to thick mud or whilst swimming. 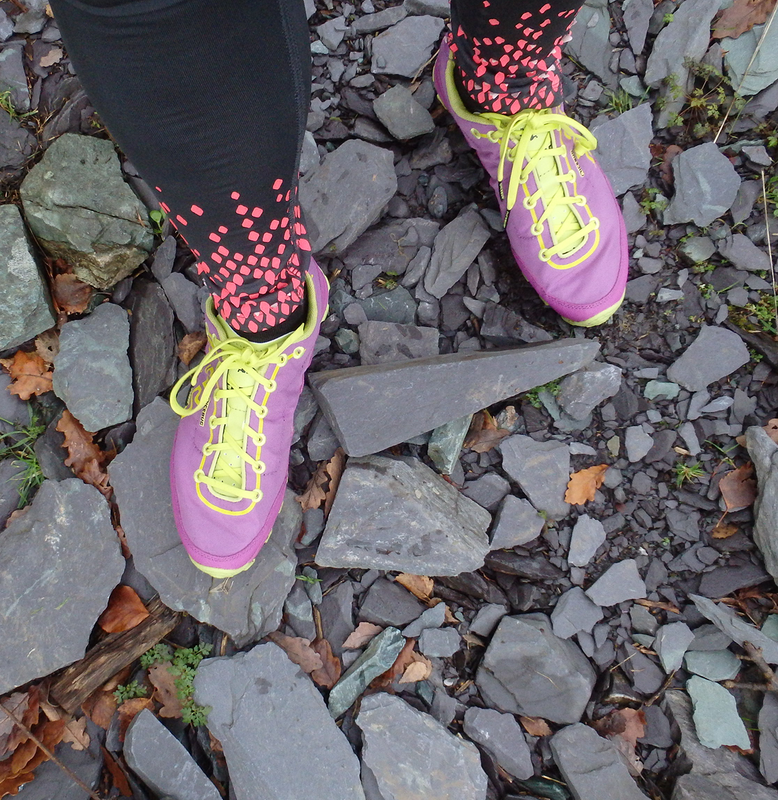 With just a 4mm drop and only light cushioning these really are are a minimalist trail shoes. The sole feels pretty flexible, and boasts an aggressive looking rubber tread that is obviously going to provide some impressive grip. The rubber compound used by ICEBUG is called ‘Rubber 9 Extreme’ and they say it was developed to provide ‘traction on the slickest of surfaces’, including wet rock. I’ve now run in the Acceleritas4 both on road and varied off road terrain, in dry and wet conditions, including swimming. I’ve used them mainly for SwimRun training but also for longer trail/fell runs so I could test their comfort over longer distances. When I first put on the Acceleritas4 they didn’t feel that comfortable. I love they way they look and had big hopes pinned in their performance, I really wanted to like them on, but there is just no getting around that fact that these are aggressive, speed orientated shoes designed to perform, even at the cost of some comfort. To their credit though ICEBUG claim themselves that these shoes are designed for short and hard routes, so bearing this in mind this is what I set out to use them for. They have a narrow fit which isn’t going to suit everyone but luckily for me it wasn’t a problem. With a bit of fiddling with the (very long) laces I managed to find a snug but comfortable compromise. These shoes feel very different to any others I’ve tried, they seem to be designed to be done up tighter than I’d normally be happy with but then the thin, supple uppers and flexible sole still allow plenty of movement. 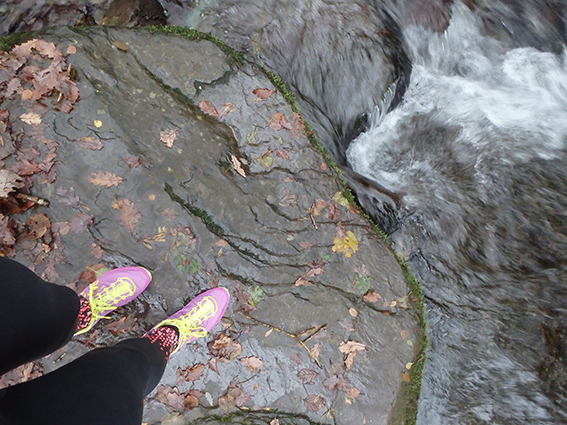 They fit closely all around your foot a little like a climbing shoe and it just takes a bit of getting used to. Despite this there is plenty of toe room and at no point have I experienced no toe bashing in them. Your foot is held securely, especially if you use the very top eyelets for lacing. The tongue is just long enough to accommodate using the top eyelets and is very lightly padded. It’s not gusseted but is kept in place by a loop through which the laces pass. A thin non removable insole offers minimal underfoot cushioning or arch support and on hard ground you can feel the rubber spikes in the sole of your foot as you move. In this respect they did slightly reminded me of the canvas hockey boots I had to wear at school, even more so as I set out on my run on a short section of tarmac where they are loud and clunky feeling. The thin uppers and minimal midsole protection did also leave me feeling a bit concerned about foot protection on the rugged and rocky terrain I knew I would be visiting. I was glad however that the outsole does rise up slightly at the toe to act as a bumper should you stub you foot against rocks or roots. After reaching the top of my tarmac climb it was time to hit some off road. My route had a bit of everything to throw at the ICEBUGs: big ups and downs, mud, grass, slate waste, wet slippery rock, streams, roots and yes, lake swimming! The Ups: When laced correctly the Acceleritas4 give a very secure fit but retain easy flexibility which was great when running up steep slopes and steps. The design allows you to twist your foot which was a great help when running over irregular rocks and roots, I didn’t experience any back slipping, even on really wet, soggy ground. The Downs: Although these shoes have little padding, on hard packed descents the rubber tread did help to absorb a bit of the impact. They offered amazing grip which really gave me the confidence to jump, turn and accelerate on steep downs without the fear of slipping. It was on soft ground that these shoes really came into their own. Wet Grass: Where other shoes have badly let me down (I’ve had bruises to prove it!) I found I could fly down wet grassy slopes, even on off camber and the rubber spikes would hold each step fast with no toe bashing. On these softer sections the padding issue was forgotten as the tread sunk it’s teeth into the ground and it felt as smooth, lighter and faster than any shoe I’ve tried. Mud: In muddy areas including both on ups and downs by footing stayed secure, and there is minimal slipping. The aggressive, spiky pattern on the tread is designed to let mud out of diagonal channels just like a tractor tire, and give ICEBUG their due, I didn’t experience any clogging up of mud on the shoe and they remained clog free and lightweight throughout my runs. Roots: I found I had great grip even on wet roots. The edges of the spiky tread, combined with the flexible soles that helped wrapped around them seemed to find every little edge and hold onto the roots as you move forwards. Rocky Ground: There are quite a lot of loose stoney paths, with some bigger and sharp stones mixed in, where I regularly run and this was a worry when it came to the Acceleritas4. With the minimal underfoot padding and little protection around the sides of the foot I often felt sharp edges in the arch of my foot and and pointed rocks though the sole. This was pretty uncomfortable and sometimes quite painful. Slippery wet rock: Damp rock on well troden trails was no problem for Acceleritas4 where it held on tight but when it came to the continually damp and slimy rocks at steam crossings I definitely had to take a lot more care and felt a few unnerving slips. You are asking a lot from any shoe if you expect it to grip to such a slick surface and I don’t feel that the Acceleritas4 lost any points here. Their performance on all other areas gave me to confidence to try them in the worst of conditions and I’m sure they still faired far better than most others. I made it out of the stream unscathed at least! Puddles and bog: The Acceleritas4 shrug off puddle splashes and shed watery mud from the uppers well, keeping your feet dry inside the shoe. 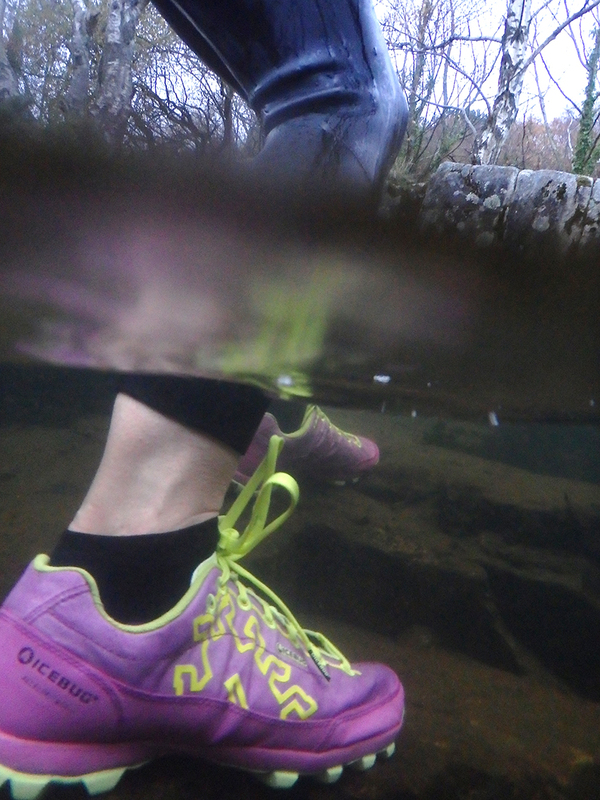 Swimming: Considering that running shoes are simply not designed to be swum in, these ICEBUGs did very well! As they are so lightweight and the fabrics they are constructed from are designed to be non absorbent, this makes them very buoyant and they float extremely well. When done up tightly and using all the eyelets they feel secure and easily stay put on your feet. When I lay facedown in the water they were buoyant enough to keep my feet right at the surface and there was no need to use extra floatation aids. I prefer not use a pull buoy anyway, but to kick as normal when swimming during SwimRun. The Acceleritas4 keep my feet in a good position high up in the water and whilst wearing a full length wetsuit were almost too buoyant as they resisted being pulled down into the kick! With a shortie they’d be perfect. On exiting each swim section they had no problem gripping in the rock as I climbed out giving me confidence to start running again sooner. Drainage: The shoes drained quickly and within about 10-12 foot strikes the worst of the squelching was over. Socks obviously retain some water so a little still pooled at the toe but they remained light feeling and I was pretty impressed. ICEBUG realise that although the fabric used in the Acceleritas4 is designed to drain quickly that to get a shoe draining fully you need some holes… they have actually produced their own video showing you how to add drainage holes with a drill! I have yet to try this tactic as think it would not be advantageous in the very wet underfoot conditions we have in the UK right now, but will let you know the result if I do! 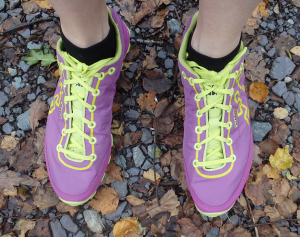 Breathability: All the time I’ve been testing the Acceleritas4 it has been cold weather and mostly wet. If it wasn’t wet I was also swimming in cold water with them so it’s hard for me to comment on the breathability of these shoes! I imagine in warmer weather they would feel quite warm compared to alternative meshy uppers, however I think with this tread design these shoes are more likely to be used in slippery, wet or possibly even snowy conditions where breathability is not so essential! A good few runs on and the Acceleritas4 are still not the most comfortable shoe for me when it comes to runs of over 20km (when I need to feel more cushioning) and I start to suffer from foot fatigue. 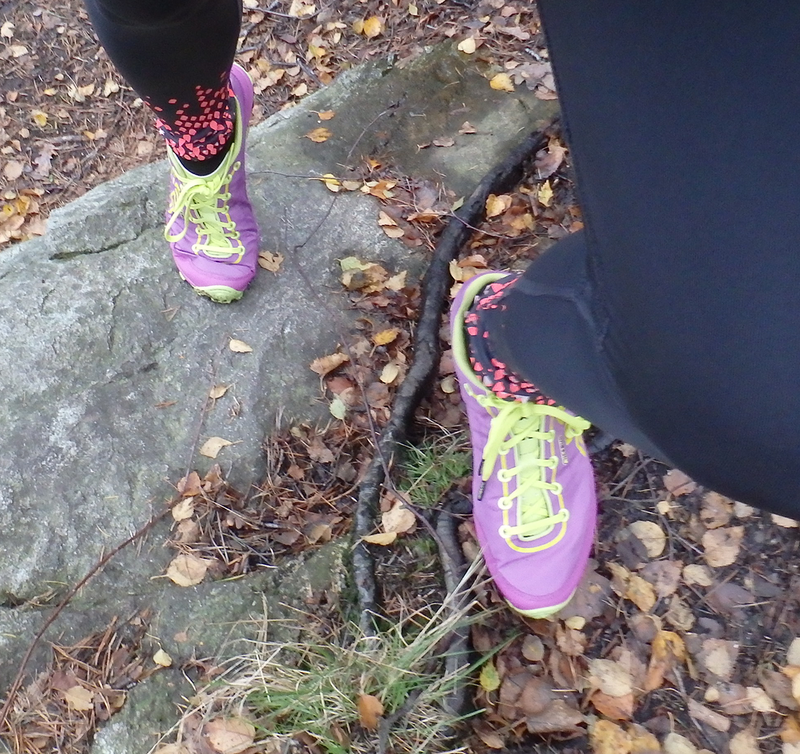 But, when it comes to short, tough SwimRun routes where the trails are at their steepest, grass is at is wettest, rocks are at their slipperiest and I need to be at my fastest and feel the confidence of that gnarly rubber sole, these are the trainers of choice. On these trails, they are so good, because this is what they are built for. The ICEBUG Acceleritas4 are the perfect shoes for anyone who wants an ultra light, super fast shoe with extra traction that will cope as well in the water as it does on solid ground. These would be great for SwimRun, Orienteers, obstacle course races, boggy fell runs and coasteering. 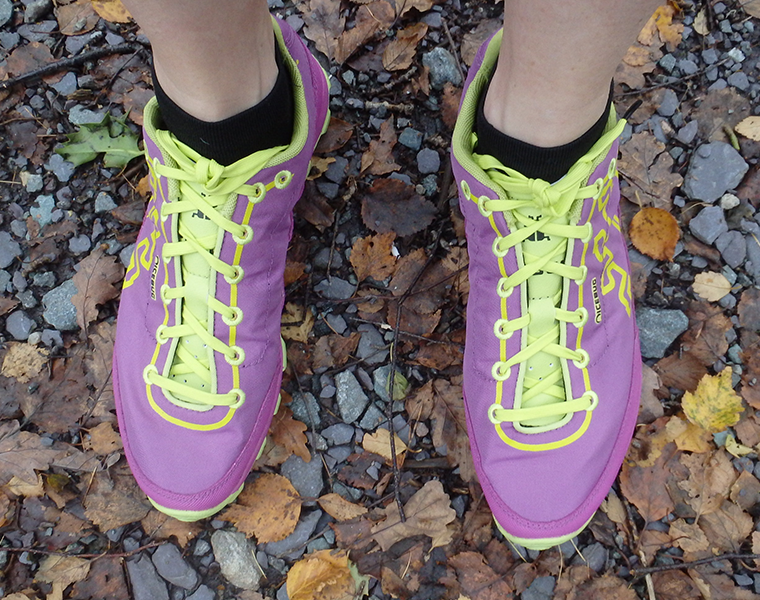 Though not for everyday use, the Acceleritas4 are an invaluable shoe to own when the conditions require it. Keep in mind that these are a minimalist shoe with almost no padding. If you are not used to a low drop make sure you build up your milage gradually before any long runs or you could find yourself with aching calf muscles, or worse! They also have a fairy narrow fit so they are not for everyone. ICEBUG shoes are relatively new to the UK so you won’t find them in many high street shops yet, so the best place to go for the full range is www.icebug.com. These shoes were provided by ICEBUG for independent product testing. All words and opinions are my own.